A Bother, A Brotherhood: Living Among The Mines In Coal Country When Mary Jo and Mike Picklo bought their house in 2003, they expected to retire in it — until a coal mine opened across the street. They don't want it there, but they are nearly alone in their view. Mary Jo and Mike Picklo stand in their front yard in Somerset County, Pa. Behind them is the Acosta Deep Mine. Walk up the white steps of the front porch where Mary Jo and Mike Picklo live, and you'll see three rocking chairs and a pair of binoculars. 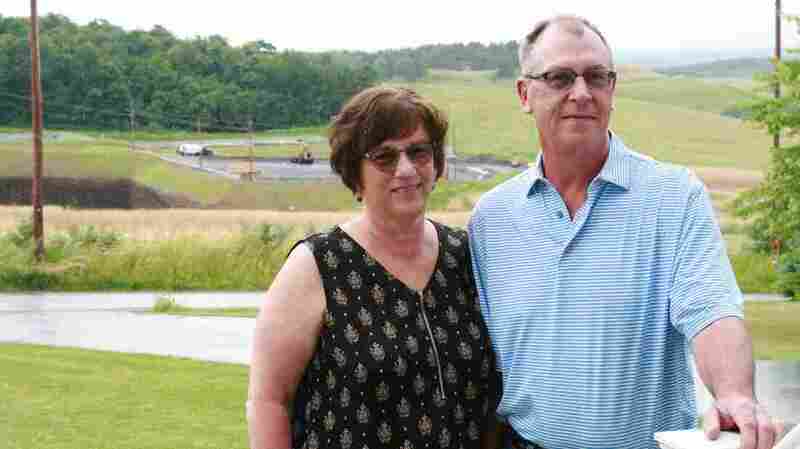 The couple bought their home on five acres in 2003 and planned to spend their golden years overlooking a vista of green farmland and thick trees in western Pennsylvania. But a few years ago, land surveyors appeared in the field across the road. Then bulldozers began digging a pit bigger than the house. Workers blasted through rock with such force the Picklos say their floors vibrated. Finally, last month Corsa Coal of Canonsburg, Pa., officially opened the newest coal mine in America. Acosta Deep Mine is 680 feet from their front door. Now, instead of watching the sunset, Mike Picklo sits outside and spies on the men at work. "Corsa Coal has sentenced us to a lifetime, to 10, 15 or more years of living in a mine," Mary Jo Picklo says. "When everybody else that works over there can just leave, we can't. Where are we going to go?" The Picklos say the coal mine is noisy, dirty and disruptive. They say floodlights beam from the site into their front windows. Coal dust from the mine is already landing on their front porch, Mary Jo Picklo says, running her finger through a thin coating of black powder on a railing. And every day, they say they hear heavy equipment rumbling and beeping loudly. Corsa Coal declined to answer questions from NPR for this story. The Picklos hosted a protest on their lawn on the day the mine opened. They say it's both a personal tragedy and a missed opportunity for their county to pivot away from a declining industry. But in Somerset County, they are nearly alone in their view. Some 70 people are expected to work in the new mine, which received a $3 million grant from the state of Pennsylvania. It will produce metallurgical coal for steel production, as NPR's Steve Inskeep reports in two stories about Somerset that aired on Morning Edition earlier this month. President Trump praised the mine in a video address to the county that voted for him by a landslide. Trump campaigned on a promise to help revive the coal industry and put miners back to work. 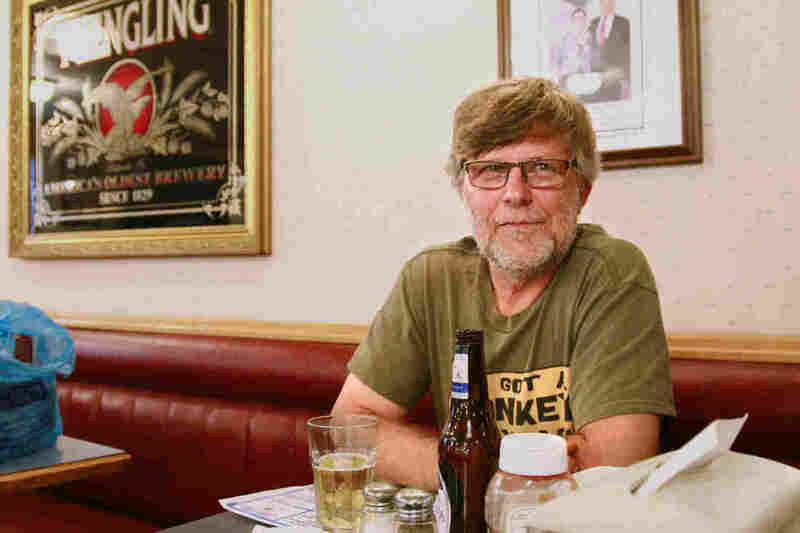 Ernest Shaulis, a coal miner of 33 years, enjoys a beer on burger night at the Fraternal Order of Eagles in Somerset County, Pa.
"I'm so proud of the fact that you're opening that mine today. I told you it was going to happen. God bless America," he said in a video screened in the June 8 ceremony. At least three other metallurgical coal mines are planned for the area. The excitement runs from the White House down to the county. The day the mine opened, Ernest Shaulis was at work at another mine, run by another company in the county. "We all watched the ceremony," says Shaulis, 63. "We're all still brothers." Shaulis speaks as he drinks a Michelob at the Fraternal Order of Eagles. It's a club in Somerset, where beer costs $2 for members. Miners can earn more than $100,000 annually, and Shaulis raised four children while working as a miner for more than three decades. "Why would you want to see a young man come in here and work in a restaurant at minimum wage, when he can go in a coal mine, if he chooses that life?" Shaulis says. "That way he has a family, his family is taken care of." A few years ago Shaulis was laid off and took the opportunity to get retrained to work above ground. He's now working at the ninth mine of his career. That instability is indicative of the American coal industry, which has shrunk as power plants switched to cheaper natural gas and automation reduced work crews. In Somerset, a county of some 76,000 people, fewer than 700 people work in mining, and many more worked in health or retail. Mike Picklo has a unique view on coal's transformation. For 40 years he worked in nearby Johnstown, Pa., building coal-hauling freight cars. He says executives gathered workers in 2013 to tell them the coal market was on an irreversible decline. The factory recently closed. For now, Somerset has made tentative steps at reinvention. Several wind farms have cropped up on the spiny ridges of the Appalachian Mountains. A medical device company hired dozens more workers to manufacture breathing aids. Coal miners are among their customers. But employers complain they cannot find skilled workers in Somerset, and few jobs offer the same high wages for manual labor as coal did. 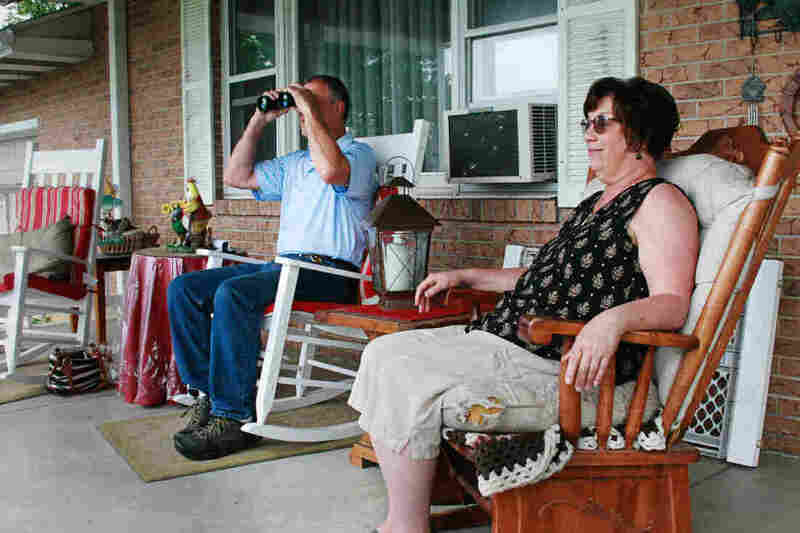 Mary Jo and Mike Picklo look out from their front porch at a coal mine that is about 700 feet away. The new jobs also don't inspire the same loyalty as coal. Terry Smith started working in the mines just after high school, as his father and grandfather had before him. He's 60 today and his lungs have hardened from all the coal dust he inhaled. They will never recover. Now he runs a bowling alley in a ski resort. But if his health permitted, he'd go back to mining. "I would," he says. "I loved it." Mike Picklo has resigned himself to the new mine. He took a short drive from his home to a second mine that began operating in 2013. He brushed aside tall grass with a broom and walked to a shaky rock ledge overlooking a pit where a conveyor belt heaped black coal into a tall pile. Soon, he mused, he might see the same view from his porch. "I can't stop it," he says. He hopes to make enough noise that Corsa is forced to buy him out of his house. "A squeaky wheel gets oiled sometimes." Daniella Cheslow (@Dacheslow) is an editor at Morning Edition. Morning Edition social media strategist Laura Roman and Morning Edition producer Barton Girdwood (@bgird2me) contributed to this story.